If you look carefully at the first shot (looking south) you can see a sign writer re-painting the sign, and also see that the next shop down was ‘Boot and Shoe’. It is apparent from the other angle that there was Greengrocery and Hardware (such an odd mix), Butchering, then Grocery and Provisions. Later on, Boot and Shoe would become the Bakers and Confectioners, and whatever that hidden shop was back-then, it became Haberdashery in the ‘forties and ‘fifties. And then there was Pharmacy in a separate shop. This entry was posted in Research and tagged Co-op, Heaton Road, shops on November 8, 2013 by oldheaton. I remember to Heaton Road Coop in the 50s and 60s much as descibed by others, except I don’t remember a Youth Club. Also, the little shop on Cardigan Terr., next to the greengrocers, was where you ordered and paid for coal, coke etc. The biggest shop in the building was the grocers. It was where the gym entrance is now. It had a pay booth in the middle at the back counter. Bacon, butter, cheese and sugar were all cut and packed to order and I used to love watching the slicing machine cutting bacon, ham etc. to the thickness you asked for; the lower the number, the thicker the slices I think. 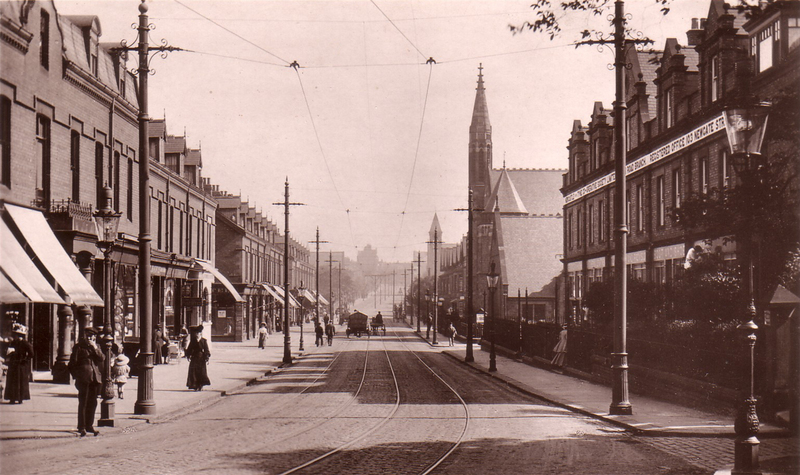 In addition to Heaton Road, I remember shops on Heaton Park Road, Chillingham Road and Warwick Street. 2716 was my Granny’s check No. She never used the word “Coop”, she always said “The Stores”. Yes John, the coal shop. I was sure I remembered that, but no-one else I mentioned it to agreed with me. And calling it ‘The Stores’ was the norm, no-ne called it the Co-op. I think the thickness of the bacon was based on the engineering scale used for cable, and nuts and bolts: 0 gauge being thicker than 2 gauge; this was Britain remember, where our rail gauge was based on the width of a horses backside: something we inherited from the Romans – but that’s a story I will tell you if we meet. Or maybe they thought the railing looked nice – which it did! Iron railings were very common in Victorian buildings where a show of “Wealth” was thought necessary. It’s sometimes hard to imagine now, but in the 1880s and 90s, Heaton was “posh” and at the begining of my life, 1950s and early 60s, it was certainly “respectable”. The Heaton Road Coop must have been built to impress and to meet most of the day to day needs of the locals. It was still busy in the 1960s and competed with the likes of the Hadrian, Laws Stores etc. quite successfully. I remember standing for a long time to get served in both the butchers and the fruit shop. Look at the doorstep of the old fruit shop, now a cafe. It’s worn down by customers feet over the years. It was still posh in the ‘fifties and ‘sixties John: steps gleamed in the terraces – scrubbed to within an inch of their lives, and front window nets were dipped fortnightly in Tintern Crescent. My matriarchs had absolutely everything delivered to their door, either by a boy on a bike (eg Bookless) or in a polished van. Again, Rington’s reign supreme to this day. No work boots ever came through a front door; I’m sure your home was the same; how posh do you want it? I do remember steps being swept, washed and sometimes “soaped”. Also, people used to sweep up the part of the backlane adjacent to their houses after the ashmen and coalmen had been. This never occurred to me as “posh”, just what almost everyone did and perhaps would thought of as odd if they didn’t do.. However, the only deliveries to our door were from Rington’s, Flounders’ butchers and, occasionaly, a laundry. I was the labourer for “going the messages” work and used to make regular visits to Heaton Park Road, Heaton Road and Warwick Street shops. As for net curtains, I remember regular changes, but couldn’t say how often and I do remember my Mother and Granny “calling” someone in Warwick St. because their nets were not gleaming white! Milk endures; coal too, although it’s no longer needed by the majority of households; however, we also had meat from the butcher (Tommy Rogers) – three times a week; fresh fish (Foggin’s) – twice a week; pop (Walker’s) – once a week; groceries from The Hadrian as often as were required; greengroceries from Bookless – twice a week; house-wares from Kleeneze or Betterware; my father’s shirts (with detachable starched collars, in big, brown, fibre boxes) from Collars; laundry (mainly bedding, curtains, tablecloths and the like) – every week; plus, newspapers of course, and Ringtons. I’ve probably forgotten one or two. If anything else was needed, I too was the errand boy. There was a special soap for the step, if I remember correctly. Heaven forefend you should have your nets tutted at! Actually, I am mistaken: the groceries came from the Stores; I was sent to the Hadrian when required. Neil Taylor mentioned the Milk Delivery office round the side by the Coal Delivery office, which rings a bell with me; can anyone else confirm that? I cannot remember a separate office, but we didn’t get milk from them. I do remember the tokens though which people left on their steps to indicate what they wanted each day. Hey John, I’ve got a couple of those tokens, and I also remember a folded tin contraption that sat on top of the milk bottle and held the tokens – see how posh it was round here; but that’s not what I wanted to say really; it was that I asked a pal of mine about cleaning the step and she told me they used a Donkey Stone. Never knew that. See: http://en.wikipedia.org/wiki/Donkey_Stone. Norman Bell & Dorothy McNeil are my parents. Would love to hear more ! Lizzie, just read your comment re Norman and Dorothy on this site. So nice to hear about someone I mentioned in an earlier comment re the Youth Club. Did they ever speak of it or dancing? Hi Sonia, I think it is wonderful that some one else remembers the ‘dancing duo” who inspired many of us. I came across the original plans for Heaton Road Co-op in Tyne and Wear Archives today (while looking for something else entirely!). The architect was Edward Shewbrooks, who went on to design the old Co-op on St Andrew’s Street in town amongst other notable buildings. His practice is shown as Grainger Street although I’ve read that his office was in Market Street at one time. The original shops from left to right (facing) were, as we knew, Greengrocer’s, Butcher’s, Grocery and Provisions but originally (in June 1891) designs were submitted for 2 houses on the end. These were altered in October 1893 to designs for two further shops: Boot and Shoe (which we knew) and Draper’s with a Milliner’s (which we sort of guessed at but couldn’t see from the shop sign on the old photo) on the first floor. The revised plans suggest that the first 3 departments were already up and running. The plans are well worth a look. They show a 47 foot ‘flour store’ and a 20 foot by 21 foot 9 ‘tea room’ on the first floor. There are also a number of handwritten objections to the building from neighbouring residents. Peter Sagar of Heaton History Group has researched and written the following about the beginning of the Cooperative movement. It is generally considered that the modern Cooperative Movement began with the setting up of the Cooperative Store on Toad Lane in Rochdale, by the Rochdale Pioneers in 1844. There had been some experiments with cooperation before this time, including an attempt at Fenwick in west Scotland the the New Lanark industrial vilage also in the west of Scotland. However, most histories date the beginning of the Cooperatives from the development of that small, modest, but now famous shop in Rochdale in 1844. However, what is less well known is that the Northeast already had a cooperative two years before the humble beginnings of the store in Rochdale, with the establishment of the Cooperative Corn Association in Middleston-in-Teesdale in1842. It must be stressed, however that this was not a retail cooperative like that in Rochdale and many of those which followed. Indeed, the first Cooperative Retail Society in the region was Blaydon Cooperative Society, which was set-up in 1858, after a reading by Joseph Cowen Junior from the book ‘The History of the Rochdale Pioneers or Self-help by the People”, by G.J. Holyoake, held in the Mechanics Institure in Blaydon. The movement soon took off in the Northeast and by 1870 there were 80 registered cooperatives in the region, with most towns and villages having their own In the course of time, they established their own dairies and farms, bulit cinemas, bakeries, department stores, funeral houses, garages, set up libraries, and developed funds to help the needy. Heaton had its own cooperative, a branch of the Newcastle Cooperative Society. Here is a little more about the Newcastle Cooperative Society and also an independent cooperative society in St Anthony’s, which was then a small village, but is now part of Walker, in the east end of Newcastle. It had a stock of flour, sugae and other groceries valued at £17 17s 71/2d – shop began only opening in the evening with commitee members present. The sales for the first quarter were £303 11s with a dividend of 1s 8d in the pound on purchases excluding sugar. Later in 1861 a sales assistant was employed paid 12s a week. The sales for the first year were £1 758 – 1862 shop extended by addition of local public house cellar. In 1864 the Newcastle Cooperative Society acquired 56, Newgate Street, before moving to 95 to 107 Newgate Street, which was acquired in 1884. New central premises were opened there in 1886, but the mayor declined to attend the opening – as local businesses were against him taking part. Prior to this, in 1867, a new branch had been opened in the Scotswood Road/Elswick area on Hinde Street and our own Heaton Road branch was opened in 1892. By 1900 sales of Newcastle Cooperative Society were half a million pounds while membership was 17 432. the dividend still a modest 2s 8 1/2d in the pound, which was still better than many other cooperative societies in the region. The Newcastle Cooperative Society, like many others in the region worked with animals and around 1900 there were three interesting animal stories regarding the society. In one story a flock of sheep, not necessarily related to the society, was being driven past the Newgate Street store when some of the sheep strayed into tailoring department, bolting through the window so rendering it completely useless. About the same time, the society’s farm manager was also instructed to “sell the black sow who had devoured another of her offspring”. Meanwhile, a mongoose acquired by the society, had one recommendation of “good service in the Scotswood Road Drapery”, but had gone astray, which understandably was causing some concern! 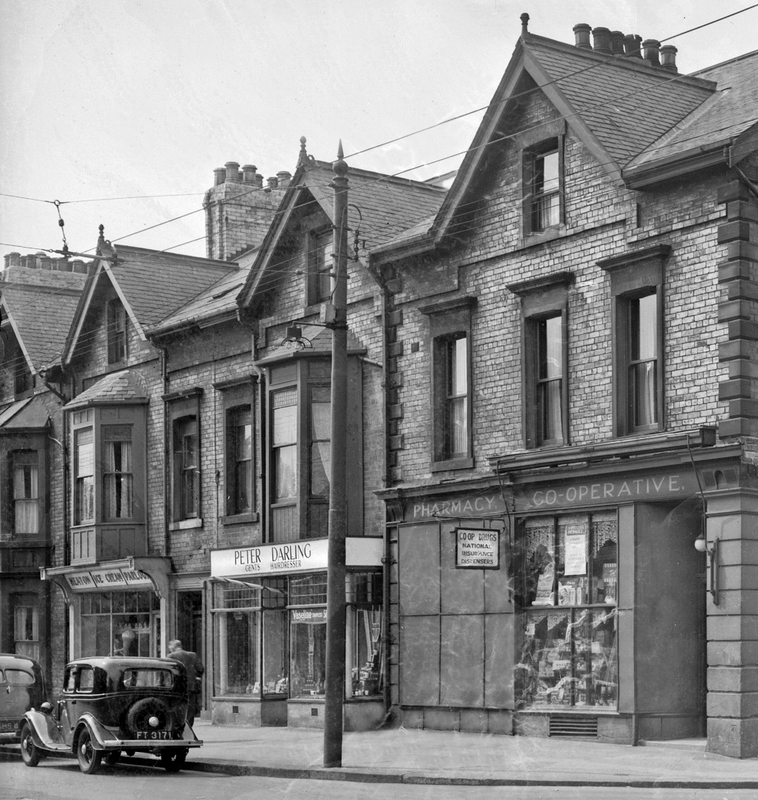 The 1930’s saw the opening of more new branches, new departments and the imposing new premises on Newgate Street, which we can still see today. There was then further expansion up to 1960 with the opening of new branches. 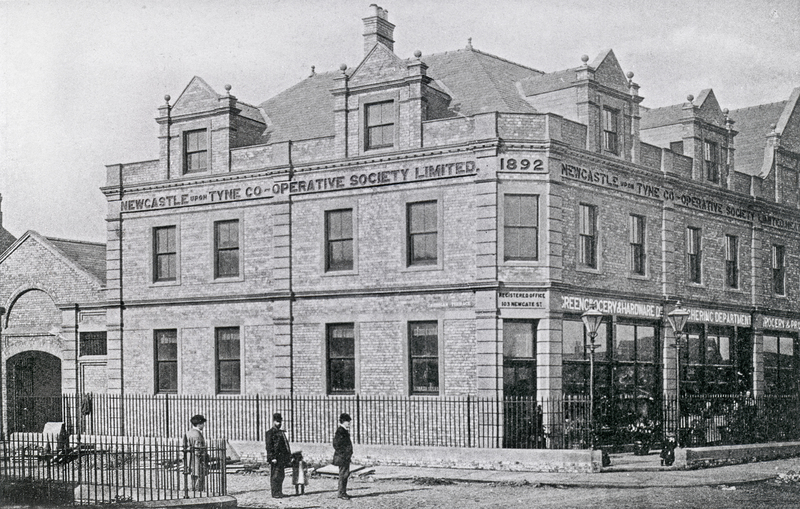 Part of the Newcastle Cooperative Society, the Gateshead Industrial Cooperative Society was formed in 1861, after a group of employees of the Northeastern Railway Company resolved to “follow the Cooperators in Rochdale”. They started in premises in rooms in the old rectory at Oakwell Gate in Gateshead. These soon proved inadequate, so new premises were found in a railway arch in Wellington Street at Gateshead end of High Level Bridge. Sales to September 1861 were £600 and membership stood at just over 100. In 1880 they moved to Jackson Street which was to become the headquarters of the Northeast Cooperative Society. Subsequently, branches opened in Low Fell in 1887, Wrekenton in 1891, Teams in 1892 and major development in Whitehall Road in 1894, “a handsome building lighted throughout by electricity”. Ultimately, Newcastle Cooperative Society was a founder member of the Northeast Cooperative Society (NECS), joining on 4th June 1970. St Anthony’s Cooperative Society, in what is now Walker in east Newcastle began as a viilage cooperative in 1875 and stayed independent because of special links with the Cooperative Wholesale Society. The CWS was a huge employer on Tyneside, indeed one of the biggest, but the CWS was only able to deal direct with sharehoding Coop Societies, while employees had to conduct their business through a retail society. St Anthony’s, charging a service fee, became the society which the vast majority of CWS employees used.